With his rare visit to London happening this Saturday at East Village, Barry Eaton was fortunate enough to have a quick chat with Mark Farina, the Chicago house legend who has since found his home on the West Coast Bay area. Plus, check out the link below to an exclusive never before heard live mix! Barry Eaton: Being from Chicago you grew up with a movement and a sound which of course would influence you in your future. Did the sound of the West Coast attract you to the area due to working with labels and artists in California and do you think regardless of location, your sound would have developed in much the same way? 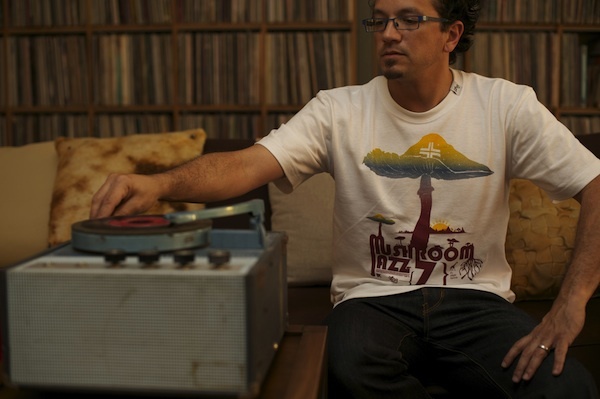 Mark Farina: At first I was attracted to things in the Bay area other than the style of music there. I was more intrigued by the lack of Chicago house. Later, the acid jazz scene that existed influenced the Mushroom Jazz side of my sound. BE: You have often played longer sets and also two sets in different rooms at a party. Is this a preference or are you equally happy to play an hour as opposed to four hours? MF: An hour is too short. Better than nothing, but not satisfying. Longer is better. 3-4 hrs. is ideal. BE: These longer sets have often been a trait of many more “experienced” DJs as well. Do you think it is a more difficult job now to play for a number of hours compared to years past? MF: No. When I started, I would be playing all night (9pm – 4am). 3 nights a week for about 6 years. So I learned playing long sets. It was harder to adjust to shorter sets. BE: A lot has been made of your recent visit to Vegas and the fact that you did not get the opportunity to deliver your set as booked to do as a result of VIP spending power. It has been read with disgust by many as a real disrespect to you and house music. Do you feel the same, think it is a sign of the times in general, or just couldn’t care? MF: I found it quite entertaining. Of course though I felt bad for the people that made an effort to come out that day though. BE: It was mentioned that you were to be rescheduled to play at Marquee in Vegas as a result of the situation. Has this been offered or are you taking a “step back” from playing at the club for a while? MF: Yes, I’m doing a make-up show / respect show on August 23. And we’re going to host an on-line contest on my Facebook page (Facebook Link) in August to win a Cabana for 4 at the show, $750 bar credit, autographed cds and headphones and some other surprises at the show. BE: Do you have any gigs coming up (other than of course East VIllage) that you are buzzing about? MF: I’m always excited about every show! BE: You’ve been quoted as saying the uk has a wonderful house scene, yet your visits are few and far between (for our liking). Is there any reason for this as it is only maybe a couple of times a year you will come over. Surely you get the offers? MF: No, don’t get many offers. Maybe it’s Elite’s fault (my booking agency there). LOL! I certainly love the U.K. though! BE: Have any of your US counterparts spoken to you about London’s East Village? If so all good I hope? MF: Just spoken to my English mates about the club. And yes, all good!! BE: All clubs, festivals and parties have a different attraction and vibe, none necessarily better than another. Is there any gig you would love or would have loved to have played at, past, present or future? MF: I really don’t have a preference, I love all types of venues and a special vibe can be created where ever you are. If the sound system is adequate then i’m happy. BE: You obviously have an extraordinary amount of music to choose for your sets, from classics, sourced material and of course a constant array of new promos. Plus with your Mushroom Jazz and house sounds at your DJ disposal, what can we expect to hear from you at East Village, or will this be a decision you will take as your 3 hour set progresses. MF: I don’t pre-plan sets at all. When choosing what to pack, it is pretty much some combination of all the above. Once the set begins, I will try some things out and see where we go. BE: Many thanks for your time Mr Farina. We are all very excited about your visit you will certainly be feeling some love in intimate surrounding or East Village basement and their amazing crowd. We know it is going to be a great night for house music and London!